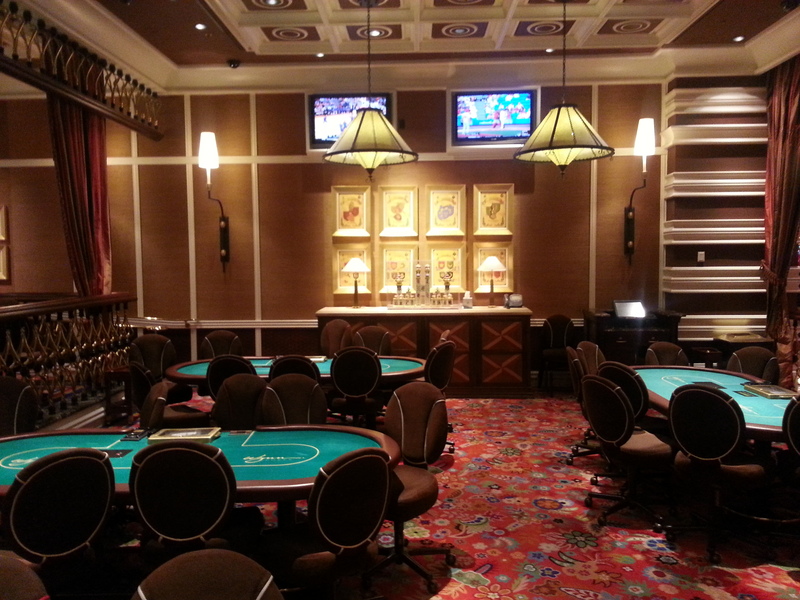 I’ve played at the Venetian Poker Room for over five years, first while vacationing in Las Vegas, then lots after moving here. This afternoon I dropped in for three hours. Overall it still ranks as the premier room in town. The space – There’s plenty of it. You don’t bump into the next player or table when you wheel your chair out. You can move easily about the room, visiting your friends, looking at other tables, or viewing the plasma TVs for sports. Chairs are well-cushioned, adjustable, and comfortable. 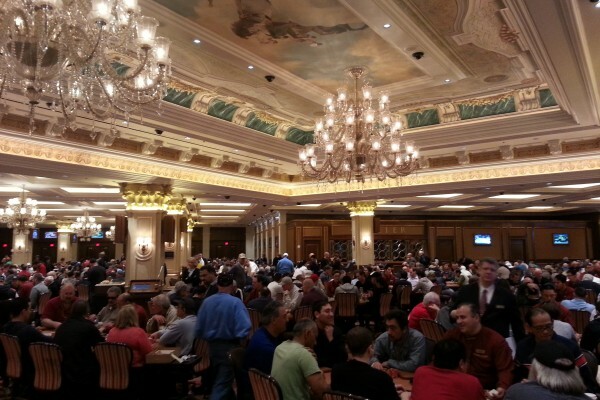 Incidentally this is becoming an increasing critique of Las Vegas casinos rooms, that the gaming rooms and tables are often too crowded especially at the peak early evening time. Its what’s led many players now to play at smaller alternative city based casinos as well as their online counterparts such as Jackpot City casino where of course there’s no gaming space limitations. 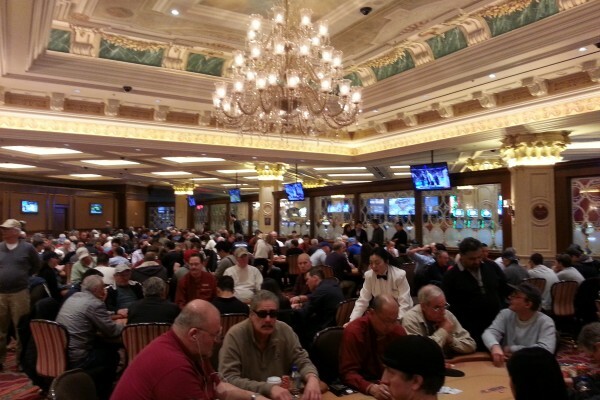 Ambiance – The high taste and high quality of the Venetian Hotel spills into the poker room. Elegant chandeliers, lofty ceilings, ample lighting, Renaissance artwork, marble floors, and new carpet. With the recent renovations most of the furnishings are brand new. Dealers – Friendly, professional, and energetic. They keep the games running fair and at a consistent clip; when it slows they know how to spice it up. All this can be a tall order considering the behavior of some poker players, especially with alcohol in the mix, yet time and time again I’ve played in extremely well-managed games. Staff & Management – Impeccable and attentive. They always dress well, act courteous, and handle challenges swiftly. That said, if someone gets way out of line, this person is asked to leave. 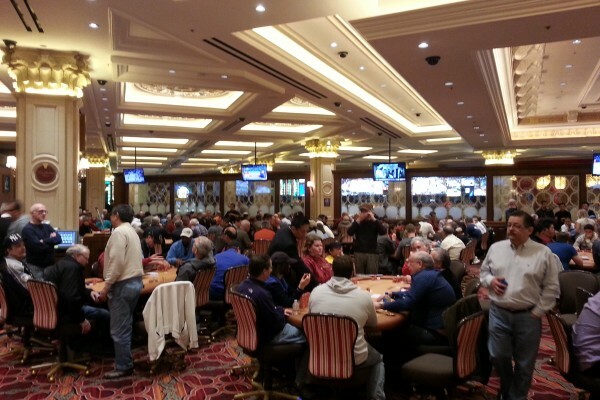 How refreshing to see a poker room draw a line in the sand, when so many other rooms let bad behavior go rampant, which sours the game for other players and nearby tables. I’ve known one of the Venetian staff, Harvey, for over 4 years. He’s one of the kindest, most positive people I’ve ever met. So many employees there are authentic; even more, they remember you. Tom Young, one of the shift managers, welcomes critical feedback so that he and staff can make the poker room and the entire poker experience better and better. Again, to maintain such a receptive and constructive frequency amidst the millions of visitors who come in and out of the Venetian—often in party mode—is highly commendable. Other Room Services & Positives – Waitresses work hard to bring you drinks; they balance beer-filled trays like Cirque de Soleil acrobats. The massage therapists are skilled, bubbly, and often gorgeous. (I don’t expect the second or third quality but it doesn’t hurt.) 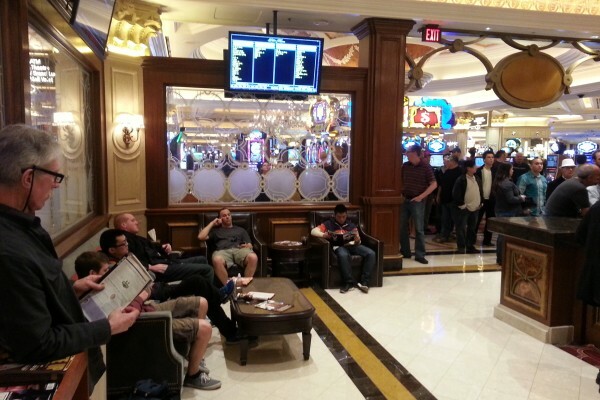 Current poker magazines fill racks next to leather chairs and leather sofas. 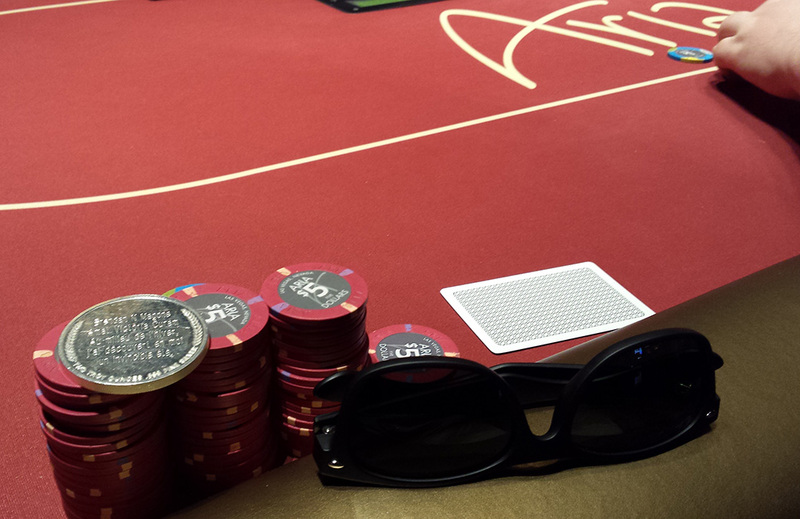 While playing, you can have a variety of cuisine or bar food wheeled right next to your chair; we poker players don’t like to miss hands. Just Outside The Poker Room – The entire Venetian experience awaits, including sports book, TAO Nightclub, Sushi Samba, bars, restaurants, music, world class shows, gaming, and more. But then again, why would you leave? 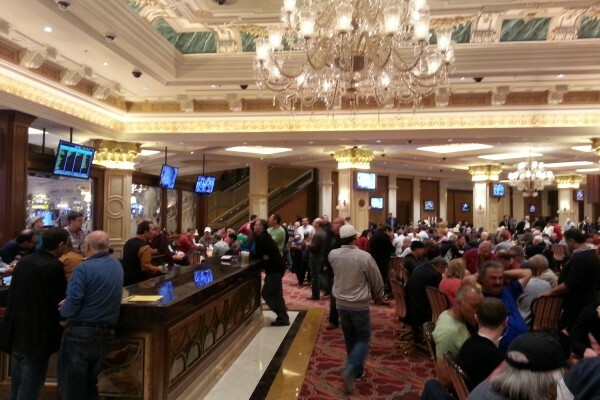 I’ve met plenty of people who plunk themselves down in the Venetian Poker Room and don’t see much else during their three to four day visit. Interesting People From Around The World – The room entertains a wide, vibrant mix of locals, tourists, Americans, Europeans, Middle Easterners, Russians, and Asians. People are usually friendly, and why not? Most are on vacation. I’ve made several stellar friends. One autumn evening, I’m sharing a table with a witty, charismatic man sitting on my left. After we share a few pints—he is English, after all—we become pals and Facebook friends. 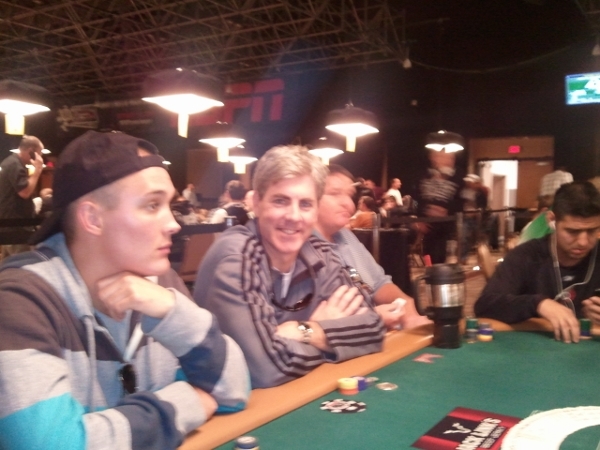 Then I find out he’s a successful professional poker player along with being a genuinely good guy. Kevin O’Leary. Two months later I’m picking him up from the airport. He gave some of the best advice on women I’ve ever heard: if you smell good and make them laugh, you’ve won half the battle. 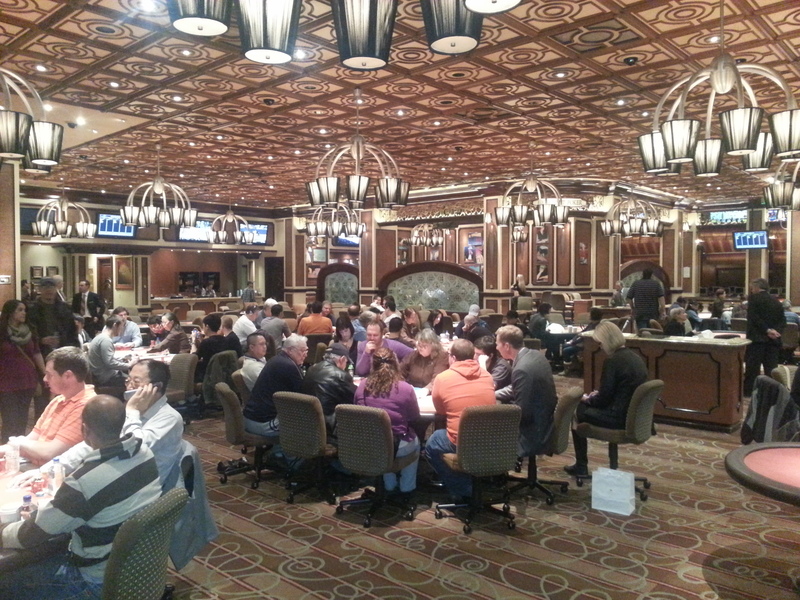 Popular Yearly Event – Deep Stack Extravaganza Series, happening right now, Jan 31 – Feb 27, 2013.